With Nadur Youngsters winning the league, the era of Victoria Hotspurs has come to an end. During this season, the Under 16 League has been won against Xewkija Tigers with a draw of 1-1. 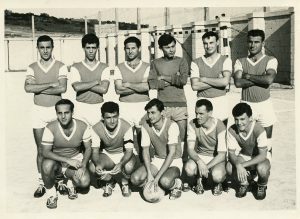 The team players were: Gorg Cardona, Gorg Portelli, Duminku Grech, Sunny Pace, Gino Mizzi, Charlie Buttigieg, Leli Attard, Gorg (Picchi) Grech, Joe Sacco, Teddy (Hitchens) Farrugia, Gorg Camilleri. Front Row: Dolindo Cassar, Joe Camilleri, Gorg Cremona, Vincent Grech, Carmel Camilleri.